In his immodestly titled talk, “High-Speed Macro Photography of a Nearly-Invisible Non-linear Subject”, Martin discusses the challenges of stopping motion, lighting a transparent object, and controlling chaos. 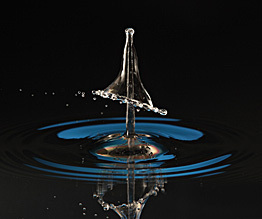 Attendees at the 2011 RSNA (Radiological Society of North America) trade show in Chicago were in for a treat - the opportunity to create their very own Liquid Sculpture images. Working with Impact Unlimited on contract to Bayer AG, Martin created a booth activity with a portable version of his equipment. 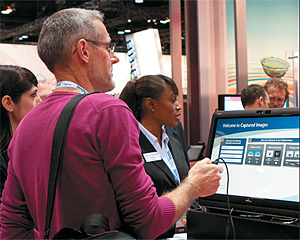 Bayer's manager of conventions, Jerry Samuels, won Exhibitor Magazine’s 2013 All-Star Award for bringing the concept to the convention floor. Martin's work wil be featured in the Northwest Center for Photography's i witness gallery at 1028 SE Water Ave., Ste. 50 this July-August. The Korean scince magazine, Science Donga, features Martin's work. 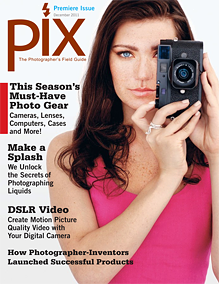 The premiere issue of Nielsen Photo Group's new online magazine, Pix, The Photographer's Field Guide features Martin's work and techniques and a small gallery of images. Martin's work will be featured in a show titled, "Flux, Flow, Flight - Art in Motion" at the Orleans House Gallery located in the London Borough of Richmond upon Thames. If you're in or around London this winter, stop in and see some original Liquid Sculpture artwork in person. 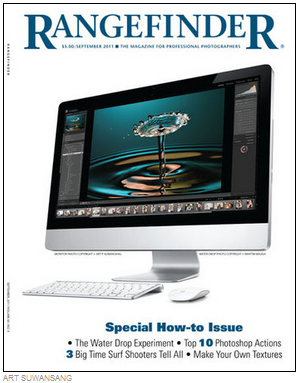 Rangefinder magazine, the premier monthly magazine for the professional photographer, is featuring Martin's work and techniques and a small gallery of images in their September issue. Back in May, 2006, they ran an article on Martin's earlier work. This is a follow-up. 360 Magazine, the official magazine of the Oslo Airport, is featuring Martin's work in their August/September issue. Martin was featured on Oregon Art Beat. Martin talks with Vince Patton about his art and techniques. You can see Martin Waugh in action on the OPB website . Martin is featured in Eyes In magazine this month. In the words of Eyes in creator, art director and editor at large Vivian van Dijk, "In the art world, beginning ideas often flourish into movements. Eyes in wants to capture the movements as they occur and encourage creators to work together and to transcend boundaries." Martin opens his studio to the public for four days in October (the 2nd and 3rd weekends). People are welcome to stop in, see how he does his work, and take some pictures themselves. 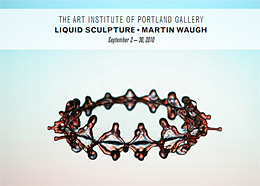 Martin will have 20 pieces at Art Institute of Portland in the Pearl District of Portland, Oregon this September 2 - 30. 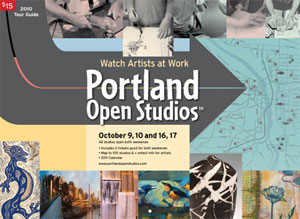 Martin will host an artist reception at the opening, 6:30 pm on September 2nd at The Art Institute of Portland. The address is 1122 NW Davis St. Portland, OR. Martin will have eight pieces in Art Basel Miami this December 3 - 6. As the sister event of Switzerland's Art Basel, Art Basel Miami Beach is the most important art show in the United States. His work will be shown as part of Aleatoric Art in booth 41 in the Aqua Wynwood exhibition space. Learn more about the show at www.artbaselmiamibeach.com. Then, January 23, 2010 - April 25, 2010, Martin will have 20 pieces at the Midland Center for the Arts in Midland, Michigan. 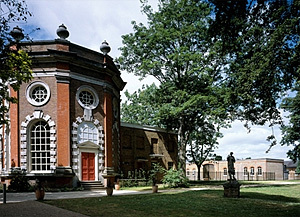 The exhibit is in conjunction with a science-related show called WaterWorks. Money Magazine featured Martin in their May issue, highlighting on his mid-life career switch. The feature, called "Second Act", focuses on Martin's path from software engineer to self-employed photographer. Martin was invited to Buenos Aires, Argentina by Coca Cola to help in a product launch for their Aquarius (by Cepita) fruit drink. The event included an exhibition of nine of Martin's works, plus three custom pieces created for the event. The three pieces were commissioned to incorporate the three flavors of the beverage: apple, pear, and grapefruit. Hosted by Horacio Kabak, Martin spoke to 60 journalists about his work and its connection to water. This fall, Discovery Channel has a new show, "Time Warp". Hosted by Jeff Lieberman from M.I.T., the theme is "all things too fast or too slow for the eye to see," it features high-speed video and time-lapse photography of a wide variety of natural events. 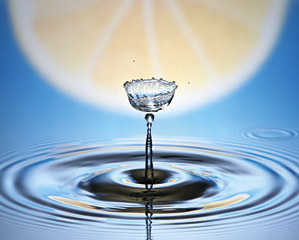 Martin is a guest on the segment called "Freerunners, a solid liquid, water droplets," that features drops and splashes. He and Jeff captured what they believe to be the first-ever slow-motion footage of a drop landing on a splash. Shot at 10,000 frames per second in HDTV resolution, the resulsts are a visual feast. Someone has posted the segment on YouTube. Martin is a co-exhibitor in "Stopping Time: The Art and Science of Harold "Doc" Edgerton's Life Work" in the Coe Gallery at the Hickory Museum of Art in Hickory, North Carolina. 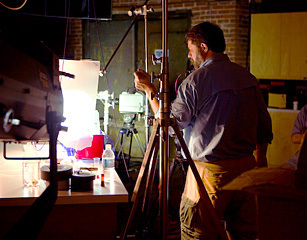 From the museum's website: "Scientist and engineer Harold “Doc” Edgerton pioneered the field of strobe photography. Capturing subjects too fast for the naked eye to witness, his photographs have a distinctive visual aesthetic. This show will feature vintage Edgerton photographs as well as images by contemporary high-speed photographers influenced by Edgerton." Martin is showing several new works at the Michael Servetus Unitarian Universalist Fellowship in Vancouver, Washington. The show runs through the month of February. Artist's Reception: Saturday, February 2nd, 5 - 7 p.m.
Stop in, meet Martin in person, and see his recent work. 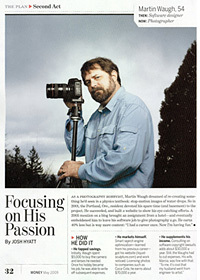 October 16th - Evening Magazine on KING5 TV in Seattle ran a short segment on Martin's work. See it here. Following its recent blockbuster TV ad for Smirnoff, advertising agency J. Walter Thompson (JWT) created a trio of ads to continue its "purity" theme. 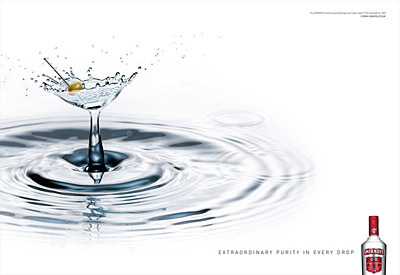 The agency selected Martin Waugh to create martini, highball and whiskey glasses out of water drops and splashes. "We always have our eyes open conducting ongoing research into the world's best and most innovative photographers," says Phillip Meyler, Art Director for JWT, London. "Martin certainly comes under those categories. No one else could have done the campaign justice." Smirnoff filters its vodka ten times and distills it three times. The creative team asked Waugh to visually convey, "extraordinary purity in every drop". Using his exclusive techniques, Waugh created and photographed splashes in the shapes of beverage glasses. See all three ads. It's a busy month in Europe: three exhibitions. One in Italy at the Metropolis Photogallery in Bologna, one in Groningen, The Netherlands at the corporate offices of Gasunie, and as a coexhibitor in a show of high-speed photography at KUSS Wolfsberg, Austria. 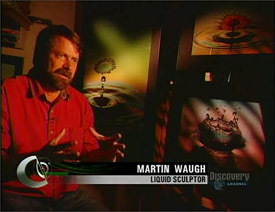 On November 28, 2006 the Daily Planet show from Discovery Channel Canada aired a segment on Martin Waugh and his Liquid Sculpture images. This five-minute interview and demonstration reveals some of Martin's techniques and insights into his work. If you are not within the U.S., you can view it at Discovery Channel Canada site under their "From the Vault" section. In the U.S., you can try a bootleg DivX version at Stage6. 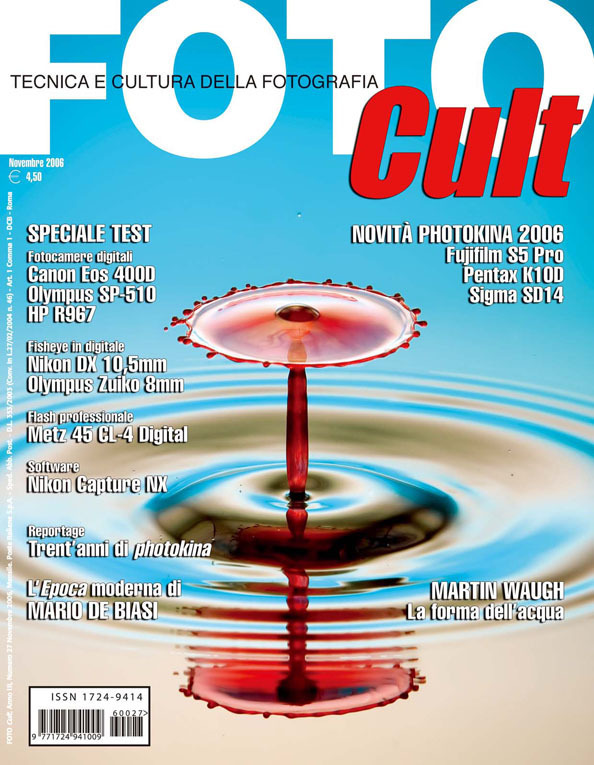 The November issue of FOTOCult, one of Italy's premiere photograph y magazines, features Martin Waugh's Liquid Sculpture work as the cover article. The six-page article contains an interview with Martin, and presents several of his intriguing images. "One who does not watch with exultation the wonders of the world receives little love from photography. 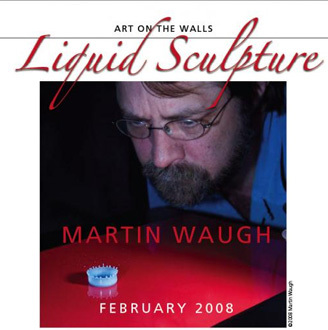 Martin Waugh knows to catch a gl impse the harmony of the nature in metamorphosis of a drop that falls; he studies the physical phenomenon and employs a refined technique in order to reveal to us the resulting shape. 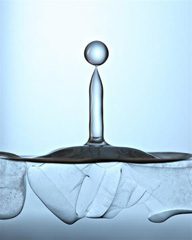 The image collection "Liquid Sculpture", an anthology that has become famous to world-wide level, is the fruit of a meticulous search on dynamics of the fluid combined with an inexhaustible supply of sincere passion. We have contacted Waugh from beyond the ocean. His words are strong statements and clear. 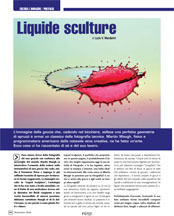 Liquid Sculpture, the portfolio that we present in these pages, probably best represents today the activity of this photographer, and it has given us, through the press and Internet, a beautiful international review."